This whole-flower extract from USDA-certified organic Green Cherry hemp is extracted with gentle heat, not harsh solvents or chemicals. Vital Plan Select Hemp Oil contains up to 6 times more native terpenes than any activated CBD on the market. The USDA-certified organic Green Cherry hemp used to create Vital Plan Select hemp oil is selectively bred for CBD and a wide array of other cannabinoids and plant components. This includes terpenes, organic compounds in hemp that support the properties of CBD – a phenomenon called the Entourage Effect. Without terpenes, you won’t experience the full potential of hemp oil with CBD. Terpenes also carry their own health-promoting properties. For instance, they have been shown to promote healthy tissue and gastrointestinal function. * And they’re what give hemp its distinctive odor and flavor – a telltale sign of a high-quality product. The Green Cherry hemp used for Vital Plan Select is grown in the first certified USDA organic hemp greenhouse in the state of Colorado. Greenhouse growing helps ensure crop quality and consistency: It controls for factors such as unwanted cross-breeding and soil changes that can occur on an outdoor farm, decrease the quality of the plant, and result in potency fluctuations between extract batches. Green Cherry hemp is also biodynamically grown, an alternative type of farming that takes a holistic, ecological, and ethical approach. 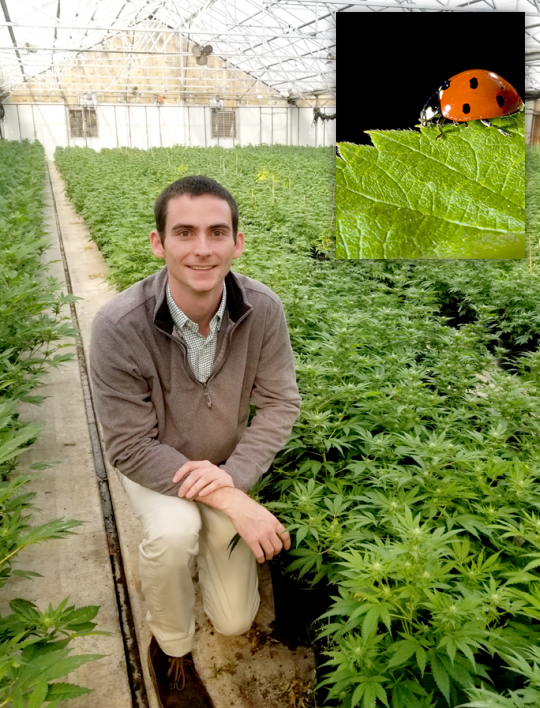 One of our favorite examples: The farmers shunned chemical pesticides in favor of ladybugs – 50,000 of them a week, which they release into the greenhouse to deal with the spider mites that tend to attack hemp. Beyond the quality of the hemp crop is the extraction process, which is equally important in any CBD product you buy. Some companies use chemical extraction and solvents like alcohol or hexane, which extract only a limited spectrum of phytochemicals from the hemp and can leave behind harmful residue. They can also disrupt the important yet fragile spectrum of terpenes. For these reasons and more, Vital Plan Select hemp oil is made using a proprietary thermal extraction process that gently evaporates a full spectrum of cannabinoids, terpenes, and other naturally occurring plant compounds. This extraction method yields clean, high-quality CBD and the highest level of terpenes available – up to 6 times more than any other CBD product on the market. 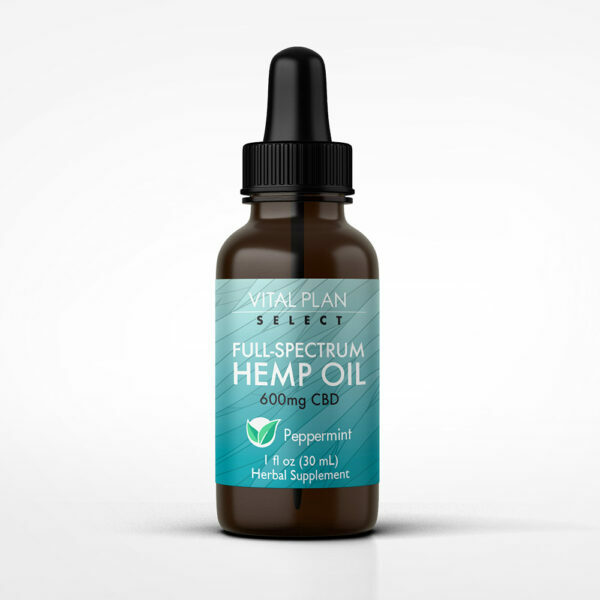 Full-Spectrum Hemp Oil: The USDA-certified organic Green Cherry hemp used to make Vital Plan Select hemp oil is biodynamically grown in an indoor greenhouse to maintain the highest crop quality and consistency. Our proprietary thermal extraction process yields a full-spectrum extract with 600 mg per bottle of activated CBD (cannabidiol), a naturally-occurring compound in hemp that promotes calm, healthy sleep, muscle and joint comfort, stress tolerance, and an overall sense of well-being. * It also extracts ample terpenes, native compounds that bolster the properties of CBD. In fact, Vital Plan Select hemp oil has up to 6 times more terpines than any other activated CBD product on the market. How much Full-Spectrum Hemp Oil should I take? An average serving range is 10-50 mg of CBD, one to three times per day. Depending on your needs, much higher servings of 100-200 mg may be equally well tolerated. 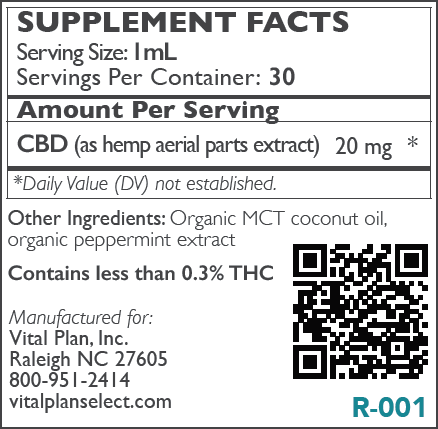 For reference, 1 dropperful (1 mL) of Vital Plan Select Full-Spectrum Hemp Oil has 20 mg of CBD. To determine the right amount for you, we suggest starting slowing with 1 dropperful as needed, or as directed by your healthcare provider. How do I take Full-Spectrum Hemp Oil? Shake well. Take 1 dropperful (1mL) as needed, or as directed by your healthcare provider. For best results, hold the liquid under your tongue for at least 15 seconds before swallowing. As with any new supplement, start slowly and gradually build up to a higher serving as you get used to the product. Most people notice effects almost immediately, but some experts suggest that full effect does not occur until after a couple of weeks of consecutive use. Occurrence of side effects is unusual with any type of CBD product. Reported side effects include tiredness, loose stools, and mild changes in appetite and weight (either increased or decreased). Both hemp oil with CBD (hemp flower-bud extracts) and purified CBD (CBD isolate) have been shown in both animal and human clinical studies to be remarkably safe and well tolerated. No. Even in high doses, CBD oil will not cause euphoria or impair coordination, balance, or motor functions. Psychoactive effects start at 3-5% THC; CBD products contain less than 0.3% THC. Use of CBD oil is associated with promoting a healthy sense of well-being, but not an exaggerated feeling of well-being. * Use of CBD oil has never been associated with hallucinations or abnormal mental activity. Can I get hooked on hemp CBD products? There is near-zero potential of becoming habituated to hemp CBD products. In other words, if you take it for a long time and then stop it suddenly, you won’t experience withdrawal symptoms. Prolonged use of CBD at high servings has not shown potential for abuse. In fact, a clinical study published in 2018 found that recreational polydrug users did not show abuse potential with use of CBD. Long-term studies have not evaluated potential changes in hormonal balance or long-term adverse changes in liver function, though prolonged use of CBD enhances metabolism of certain drugs. Our products are 100% gluten-free and dairy-free, and are third-party tested for toxins, pesticides, and safety. I’m vegetarian/vegan. Can I still use Full-Spectrum Hemp Oil? Yes, Full-Spectrum Hemp Oil is free from animal ingredients and animal derivatives. 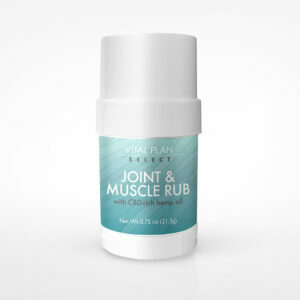 Each and every one of our products is formulated by Vital Plan Select founder Dr. William Rawls. Dr. Rawls is a practicing physician and herbal expert with more than 20 years of experience in the herbal and supplement industry. You can read more about Our story. Yes, CBD is legal in all 50 states according to state law. Though all cannabis products are still illegal according to federal laws, those laws are not being enforced. Even federal legality of CBD from hemp is getting ready to change: A farm bill that has been approved by the Senate and House is expected to be signed by the president eminently, which would completely legalize CBD from hemp in all 50 states. Hemp and marijuana are both varieties of the same plant, Cannabis sativa. Though both plants look the same, their chemical composition is quite different. The chemical difference has to do with the presence or absence of certain enzymes. Both marijuana and hemp contain a chemical substance called cannabigerol (CBGA), which is concentrated mostly in the flower buds of the plant. Marijuana contains an enzyme that converts CBGA into THC; hemp contains a different enzyme that converts CBGA into CBD (cannabidiol). Whereas marijuana contains both THC and CBD, hemp, as found in this product, contains almost exclusively CBD — THC occurs only in very trace amounts. Only cannabis with less than 0.3% THC can be legally classified as hemp. Both THC (in marijuana) and CBD (in hemp) belong to a class of plant chemical compounds called cannabinoids that bind to receptors in the endocannabinoid system. The endocannabinoid system modulates endorphins (chemicals that modulate the pain response), the balance of neurotransmitters in the brain, immune system functions, emotional centers, and metabolism. THC binds to endocannabinoid receptors very tightly, causing an exaggerated or euphoric response — in other words, you get high. In the process, it also suppresses endocannabinoid receptors and levels of natural endocannabinoids in the body. CBD, on the other hand, weakly binds to endocannabinoid receptors in the brain and body, gently stimulating and blocking them at the same time. This has positive results without an exaggerated euphoric response, so you don’t get high or intoxicated in any way. * In addition, regular use of CBD seems to increase endocannabinoid receptors and natural endocannabinoids. What’s the difference between CBD isolate and CBD oil? CBD isolate is purified cannabidiol (CBD) without any other chemical components of hemp. Usually purity is a good thing, but in this case, purified CBD is missing all of the other wellness-promoting compounds the hemp plant has to offer. Full-spectrum CBD oil contains cannabidiol, plus the full spectrum of other components of the whole plant, including trace amounts of THC (at less than 0.3%), other cannabinoids, and terpenoids. The trace amount of THC in CBD oil (<0.3%) is not enough to trigger most drug tests as being positive for THC. You would need to consume about 1000-2000 mg per day of CBD to fail a drug test for THC if the employer is testing to SAMHSA guidelines (Substance Abuse and Mental Health Services Administration). If you are tested regularly and taking high doses of CBD, and you are concerned about the very low risk of a positive drug test for THC associated with using hemp-derived products, you could opt to use purified CBD, which does not contain anything but CBD. Just know that purified CBD doesn’t provide the same spectrum of benefits as CBD oil. How do I know Vital Plan Select products are safe? Each of our products comes with an independent certificate of analysis verifying the ingredient identity, purity, and standardized constituents, where applicable. This includes testing for heavy metals, organic toxins, and microbiological contaminants. What if I am taking prescription or over-the-counter medications? CBD rich products can alter the metabolism of certain drugs so we recommend you check with your healthcare provider before using this product if you are taking medications.